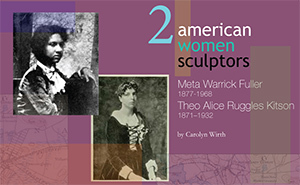 Download my newest article on the working lives of Meta Fuller and Theo Alice Kitson, two sculptors who lived and worked in the Boston area. Born only six years apart, they nevertheless lived in different worlds. Theo was a wealthy and prvileged young girl of fabled talent, who became a rock star artist of the early 20th century. Meta Fuller fought against adversity in society and at home to carve out a career as the forerunner of the Harlem Renaissance. And check out my first article on Edmonia Lewis and Sally Farnham, whose monumental sculptures brought them fame and occasional fortune.